Thala Ajith & Thalapathy Vijay are the two stars that Kollywood swears by. with Super Stars like Rajinikanth, Kamal Haasan, Dhanush, Suriya etc. celebrity 100 has been in the news since 1999. 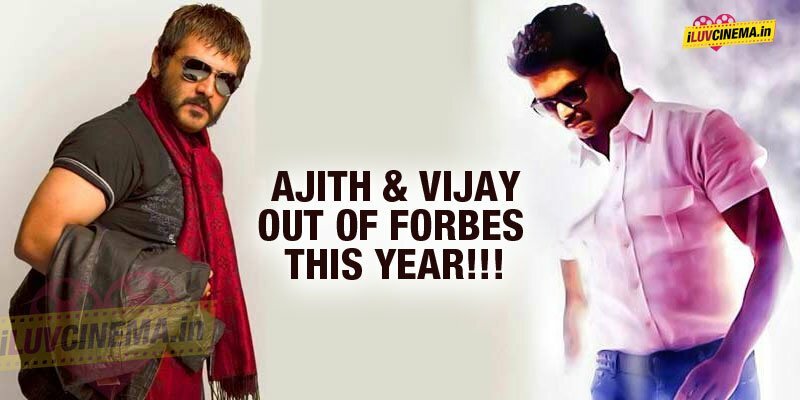 Recently Kollywood Forbes list celebrities being announced, fans of Vijay and Ajith got shocked as their names was not shortlisted in Forbes list where Vijay, Ajith and A.R Murugadoss was included in last year’s list. Instead of Vijay and Ajith new entries was found in the list, new entries this year among the Tamil stars are comedian Santhanam at 52 and actor Arya at 80th position. Among the actress, Kajal Aggarwal holds the 58th spot followed by Shruti Haasan at 61st in this year’s list. Also AR Rahman who earned the top position among the celebrities from down south at 14th spot. While cricketer R Ashwin has secured the 31st spot, among the Kollywood actors Dhanush tops the table as he holds 37th position beating Rajinikanth and Kamal Haasan, who are at 46 and 69th positions respectively in Kollywood Forbes list. Baahubali director Rajamouli who helmed the super-duper hit Baahubali is positioned 72nd . Bollywood’s King Khan who was positioned 3rd last year, tops the table this year among all the celebrities in India. Shah Rukh Khan has beaten actor Salman Khan who came out tops in 2014.